Posted in Beaches, Outdoor Activities, Things to do with Kids, What to Do? 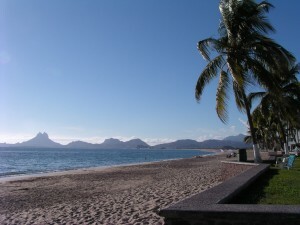 There are many fantastic beaches in San Carlos and Guaymas — some are secluded, and others are located in the busier areas by marinas and restaurants. By law, all beaches are open to the public, which means that you are permitted to go on any beach, even if it is in front of residences – you just need to find a public access point or entry. 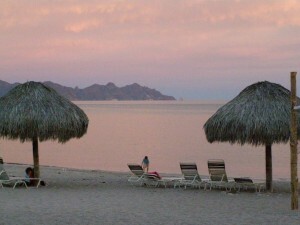 “Algodones” means “cotton” which is a perfect name for this beautiful beach with soft white sand dunes. It has the softest smoothest sand in San Carlos. To get there, take the main highway to Paradiso Hotel. A half mile before reaching Paradiso, turn left toward the beach. 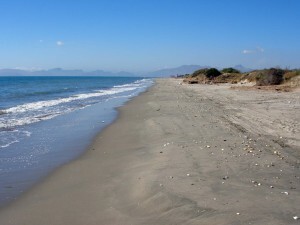 There are several dirt roads that give access to the beach. The beach goes from the San Carlos Plaza Hotel to Paradiso Hotel and beyond. The next stretch of beach between the two hotels though part of Algadones is also called Catch 22 Beach because the movie was filmed there in the early ‘70’s. The sandy area in front of San Carlos Plaza is clean and well-maintained. You can enter this area by driving a little further up the highway towards Paradiso Hotel, and then follow the signs to the Soggy Peso / Hang Out. With the restaurant open for lunch and dinner serving good food and drinks, this is a very popular spot on weekends to “hang out”. There is great snorkelling along the rocks to the right of the restaurant and on the other side by the Paradiso hotel. You will often see kite boarders making use of the winds in this area. Once a month the restaurant hosts a Full Moon party. La Posada is a short drive from the main road in San Carlos. Turn left at the sign for La Posada Condominiums, and drive towards the water. There is a parking lot close to the beach and behind La Palapa Griega restaurant. 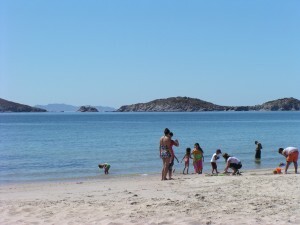 La Posada is a beautiful beach in a protected cove. You can snorkeling up either side of the cove. At the far end is a cave. If the tide is low, you can walk to the cave and if the tide is high, you can snorkel or swim. This is also a nice beach to read on the lounge chairs under the shaded palapas, and then have dinner and listen to the nightly entertainment at the restaurant.You may also be lucky and find dolphins swimming near the shore. This is a great place to snorkel, dive, swim and kayak. It is a beautiful quiet area. 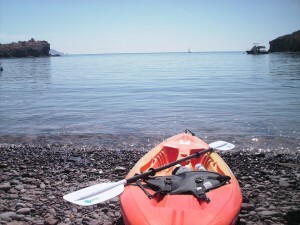 You can rent kayaks from the Beach Club (singles and doubles). However, they do not rent snorkel equipment, so bring it with you if you want to snorkel. There are chairs and lounges that belong to the MarinaTerra Hotel. You can purchase drinks and refreshments from the Beach Club, and then use their bathroom facilities, which are very clean and nice. To get to the beach club, take the main road past the MarinaTerra Hotel, and then turn left at the roundabout and continue to follow the road towards the water (at the Marinaterra Beach Club). If you go in through the Beach Club entrance, you may be asked to pay a fee, even if you just want to pass through to get to the beach. So instead, park in their lot, and then walk to the left of the Beach Club where you will see a path beside a home (adjacent to the Club) which you can use to get to the beach. Click here for a map. During jellyfish season, there tends to be a lot in this area, so take care. Miramar has a popular beach that is busy on weekends with volleyball, pedal boats, kayaks, lots of kids and teens, music, and a beer and taco restaurant. 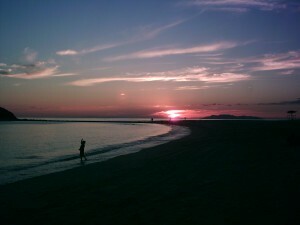 You will get a great sense of the Mexican culture by coming to this beach on a crowded weekend. Often you will see dolphins swim by. 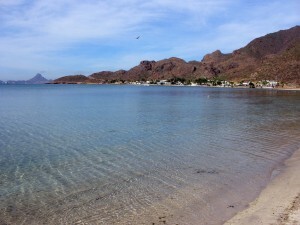 To get there, go to Miramar, which is located between San Carlos and Guaymas. Turn right before the overpass bridge on the way into Guaymas. Make a right at the residential street nearest to the water at Bacochibampo Bay. Drive to the end of that street, and park in the dirt parking lot. 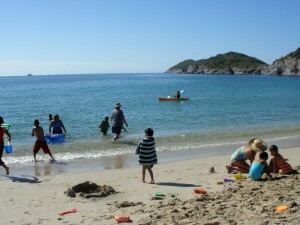 Playa Piedras PintasThis is another great location for snorkeling, diving and kayaking. Snorkeling and diving are good up both sides of the cove. A second cove and beach are further to the left.There are no shade structures on this beach, so bring an umbrella. There are also no facilities.To get here by car, pass the RV park on your right, drive over the topes, and then turn left before starting up the hill towards the Mirador. Drive down a dirt road to the first beach in a string of little coves and sandy beaches. There is plenty of room to park. 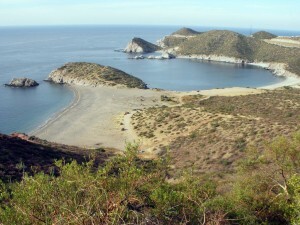 Piedra Pintas is sometimes also called Frenchy’s Cove or Lalo’s. Pilar BeachYou can reach this beach by way of the paved road to Condominios Pilar and Bahia Delfin, just off the main highway coming out of San Carlso. Continue along the road to the left of the condos (towards the estuary). You will park in a dirt parking lot.This area has a long, sandy beach with cream-colored sand, pretty shells and good swimming. The section adjacent to Pilar Condos and Condos Delfin is well tended by the condo maintenance staff. The waters at this beach have soft, sandy bottoms. There is no shade, so bring an umbrella. Dolphins are spotted daily at this beach, and they swim quite close to shore.The beach is beside the Soldado estuary, which is a beautiful spot to walk or kayak. You can rent kayaks, windsurfers, or hobie crafts here. Call San Carlos Aquatic Adventures at 622-855-5926. There is a public restaurant located in the middle of the condos. They serve lunches and dinners, and you may use their bathrooms when the restaurant is open. Otherwise, there are no public toilets. Playa del Sol is past Cochorit, south on Highway 15. Turn right at Kilometer 113 and continue down a dirt road towards the beach.